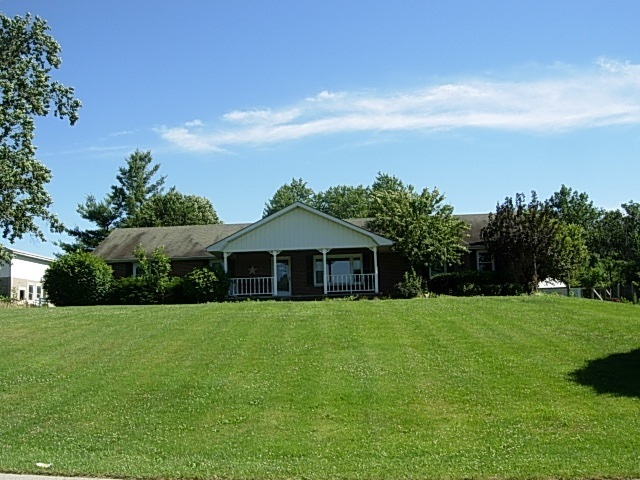 Beautiful 3 bedroom, 1.5 bath brick ranch with recent updates on 3.18 acres. Semi open floor plan with an office, large great room w/fireplace, dining room and generous sized eat-in kitchen with plenty of cabinetry and storage. The laundry and mud room on the main level are easy access to the kitchen. The sunroom and outside patio are a great area for entertaining. The basement offers extra storage, a small kitchen and cabinetry. Several outbuilding include a poultry house, barn w/stalls (electric & water) and a large shop with a 12' door (electric only). The fenced lots offer space for pets or livestock. Paved asphalt drive and generous landscaping. REDUCED! !